Andrew Roberts, Churchill: Walking with Destiny. New York, Viking, 2018, 1152 pages, $40, Amazon $25.47, Kindle $17.99. 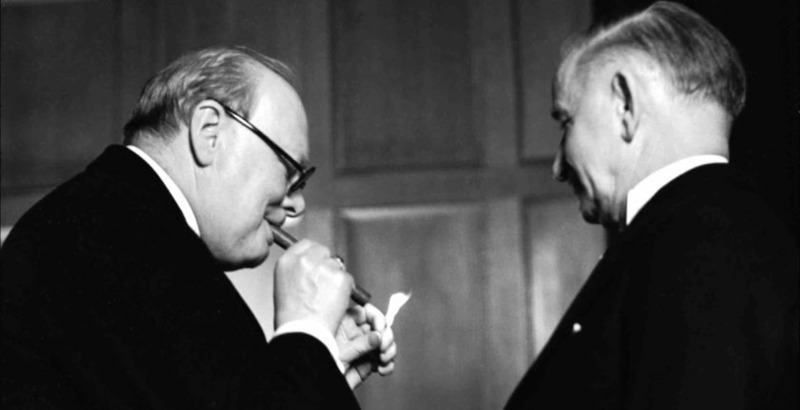 In 1960 General Lord Ismay, the devoted “Pug,” WSC’s wartime chief of staff, said that an objective Churchill biography could not be written for fifty years. Andrew Roberts weighs in at year fifty-eight. The delay paid off. Roberts was able to access sources only recently available, not least of which are Hillsdale College’s The Churchill Documents—invaluable papers now in print through World War II. Other sources include the Royal Archives at Windsor; the private papers of Churchill’s family; and diarists like Ivan Maisky, Stalin’s ambassador to Britain, only recently published. With his gift for separating wheat from chaff, this accomplished historian boils the saga down to digestible size. Full disclosure: This writer labo(u)red for over a year as one Roberts’ readers, sifting every word of his manuscript. Our emails, as he kindly notes, reached four figures. Together with the tenacious Paul Courtenay, we tackled every question, running down facts and factoids, arguing out every conclusion. With Hillsdale’s help, we checked unpublished parts of Sir Martin Gilbert’s “wodges”—documents, clippings and letters compiled by the official biographer for almost every day of Churchill’s life. Mr. Roberts, to quote his subject, “left no cutlet uncooked.” This is the first biography I’ve vetted since Manchester’s The Last Lion, so I am perhaps qualified to compare. No one will ever reach the lyrical heights of Horatius at the Gate, like Manchester did. Roberts is far more illuminating, accurate and up to date. Walking with Destiny is a masterpiece—the finest single Churchill volume you can hope to read. To paraphrase Simon Schama on Gilbert’s volumes, it is a “Churchilliad,” and Andrew Roberts is its Bard. The great man’s courage vied with his emotion, Roberts writes: “Lady Diana Cooper left a charming account of [a wartime] weekend at Ditchley…. ‘We had two lovely films after dinner…. Winston managed to cry through all of them, including the comedy.’ She told him that night that the greatest thing he had done was to give the British people courage. ‘I never gave them courage,’ he replied. ‘I was able to focus theirs.’” Exactly. He was right about that—and consistent. In July 1943 he told Sir Arcot Ramasamy Mudaliar, India’s representative on the War Cabinet: “It was only thanks to the beneficence and wisdom of British rule in India, free from any hint of war for a longer period than almost any other country in the world, [that India] had been able to [produce] this vast and improvident efflorescence of humanity…. Your people must practise birth control.” Then he added (and we will never see this quoted by his Indian haters): “The old idea that the Indian was in any way inferior to the white man must go….We must all be pals together. I want to see a great shining India, of which we can be as proud as we are of a great Canada or a great Australia.” There is the true Winston Churchill. Churchill famously “ratted” on the Conservatives over Free Trade—but was that his only objection? No, says Roberts: “Years later Churchill admitted that such was his reaction against the party at the time, over the harsh treatment of the defeated Boers, Army reform and the way the 1900 election victory was being exploited, that ‘when the Protection issue was raised I was already disposed to view all their actions in the most critical light.’ Churchill was spoiling for a fight with his own party.” This is fresh, excellent analysis. I have never heard his change of parties so comprehensively explained. Space is running out and I haven’t told you the half of it. There are 78 illustrations, most of them unique even to jaded Churchillians. Roberts did his best to avoid “old chestnuts.” There are sixteen pages of clear maps. The 1950s Reader’s Union map of Churchill’s wartime journeys is worked nicely into the endpapers. The book weighs 3 1/2 pounds—don’t drop it on your foot. The page stock is thin, but well chosen to minimize bleed-through. The bibliography, attesting to its thoroughness, runs to 23 pages, the author’s notes to 37, the index to 60. Amazon offers an attractive 40% discount and a Kindle version. This is little to pay for the education you’ll receive.